Only 11.5 Million Miles Away Now! 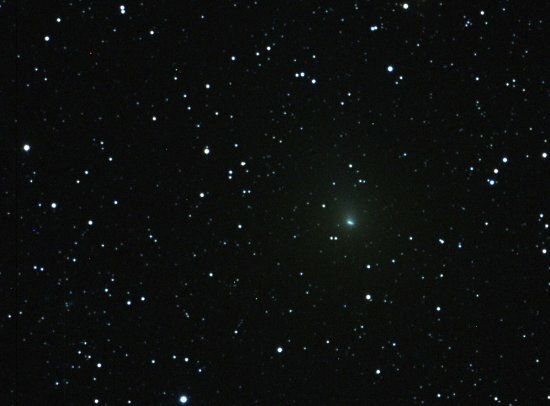 MSFC astronomer Bill Cooke took this five-minute exposure of Comet Hartley 2 late on the night of Saturday, Oct. 16, 2010, using a 10″ telescope in New Mexico. The comet, which has now reached naked eye visibility, was just under 11.5 million miles from Earth and sporting a coma over a degree across — twice the size of the full moon. You can read more about the “coma” and other parts of a comet at the NASA Worldbook: Comets page. This very active visitor to our neighborhood makes its closest approach around 8 a.m. EDT on Oct. 20, at a distance of 11.2 million miles. 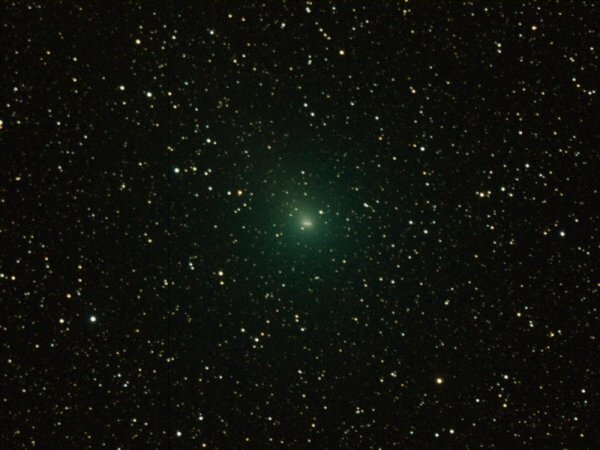 Unfortunately, the light from the nearly full moon will tend to wash out the comet’s pale green glow, so comet watchers are advised to make use of a pair of binoculars for the best view. Image courtesy of Bill Cooke, NASA’s Meteoroid Environment Office, Marshall Space Flight Center, Huntsville, Ala.
&apos;Only&apos; 14 Million Miles Away! The skies were clear over New Mexico last night — Oct. 6, 2010 — so Rhiannon Blaauw of NASA’s Meteoroid Environment Office, Marshall Space Flight Center, Huntsville, Ala., captured this image of Comet Hartley 2 at a distance of “only” about 14 million miles from Earth. Hartley 2 has passed out of the constellation Cassiopeia and is now traveling through the constellation Perseus. On October 20th, the comet will come within 11 million miles of Earth. 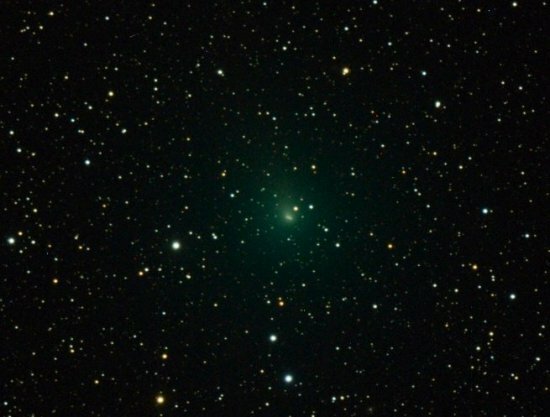 Since comets rarely come this close, it will be faintly visible to the naked eye in the early morning sky. The comet has an orbital period — or time to travel once around the sun — of approximately 6.5 years. For those interested in astronomy photography, the image was taken with a single shot color filter with 300-second exposure via a remote-operated telescope located in Mayhill, N.M.
We’re tracking Hartley 2’s journey as it approaches Earth, so stay tuned for more photos! Image courtesy of Rhiannon Blaauw, NASA’s Meteoroid Environment Office, Marshall Space Flight Center, Huntsville, Ala. Author Marshall Space Flight CenterPosted on October 7, 2010 May 23, 2013 Categories UncategorizedTags comet, Hartley 2, Jupiter, Marshall Space Flight Center, Perseus4 Comments on &apos;Only&apos; 14 Million Miles Away! In this image taken on the evening of Friday, Oct. 1, Comet Hartley 2 can be seen in the constellation Cassiopeia (north-east sky, not far from horizon). Hartley 2 will only be in Cassiopeia for a few more day before traveling through the constellation Perseus. It’s a Jupiter Family Comet that we can’t see right now because it’s too tiny at approximately 1.2 km across. In this image, the comet was still 16,500,000 miles from Earth. On October 20th, Hartley 2 will will come within 11 million miles of Earth, and since comets rarely come this close, it will be visible to the naked eye in the early morning sky. The comet has an orbital period, or time to travel once around the sun, of approximately 6.5 years. For those interested in astronomy photography, the image was taken with a single shot color filter with 300-second exposure. It was captured by Rhiannon Blaauw of NASA’s Meteoroid Environment Office, Marshall Space Flight Center, Huntsville, Ala., via a remote-operated telescope in Mayhill, N.M.
We’ll be keeping an eye on Hartley 2 as it approaches Earth, so stay tuned for more photos! Images courtesy of Rhiannon Blaauw, NASA’s Meteoroid Environment Office, Marshall Space Flight Center, Huntsville, Ala. Here Comes Comet Hartley 2! Comet 103P/Hartley 2, a small periodic comet, was discovered in 1986 by Malcolm Hartley, an Australian astronomer. It orbits the sun about every 6.5 years, and on Oct. 20, the comet will make its closest approach to Earth since its discovery. In this case, “close” means 11 million miles, or 17.7 million kilometers. A moonless sky will make for promising viewing conditions in the northeastern skies, especially just before dawn. Comet Hartley 2’s nuclear diameter is estimated at 0.75-0.99 of one mile — 1.2-1.6 kilometers — and it’s believed to have enough mass to make approximately 100 more apparitions, or appearances, near Earth. 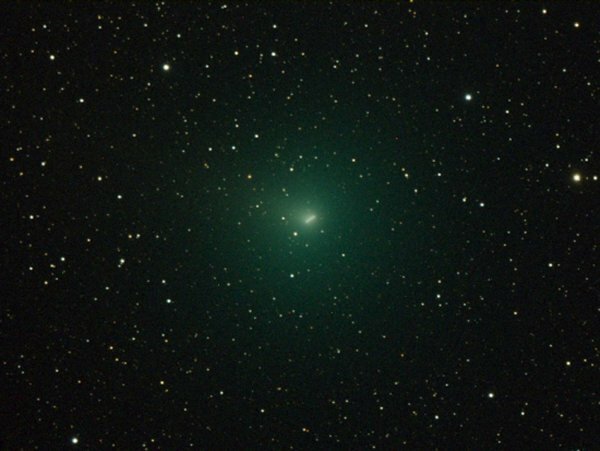 The 2010 appearance also marks one of the closest approaches of any comet in the last few centuries. Images courtesy of Bill Cooke, NASA’s Meteoroid Environment Office, Marshall Space Flight Center, Huntsville, Ala. Author Marshall Space Flight CenterPosted on September 29, 2010 May 23, 2013 Categories UncategorizedTags Bill Cooke, Cassiopeia, comet, Hartley 2, Marshall Space Flight Center5 Comments on Here Comes Comet Hartley 2!